Game of Thrones depicts a violent and, some might say, lawless world. Few would think that world evidences much international law. 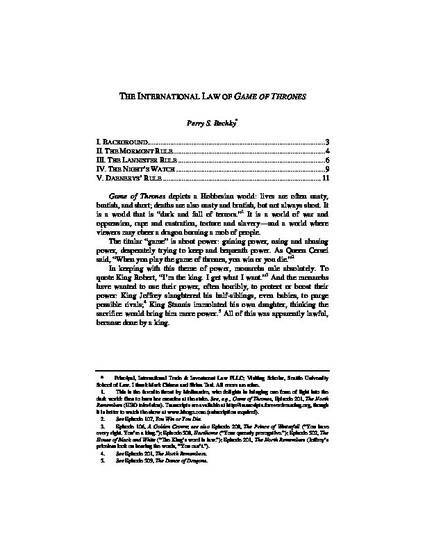 Yet, this article identifies several rules of international law observable on the show and relates them to real-world international law. Observable rules include some fundaments of the law of treaties, customary norms, and (most surprisingly) at least one humanitarian peremptory norm. These rules cover a range of subjects, including sovereignty, state responsibility, jurisdiction, immunities, and human rights. The article also discusses the special legal status of the Night’s Watch, which is governed by the most important legal “text” in Game of Thrones. Finally, the article tries to have some fun. The article is current through the end of Season 5 (spoiler alert!). Originally published in the Alabama Law Review Online, August 28, 2105.